Hosting within a fast and reliable network. Network and Servers are redundant for optimal accessibility. A service desk, which is ready on weekdays from 9.00 AM to 5.30 PM, to answers all e-mails as quickly as possible, but at least within one working day. 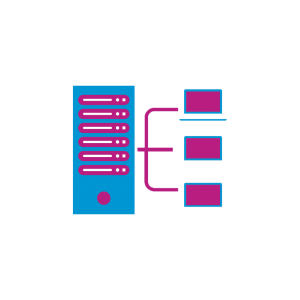 Wide choice of hosting packages, both Linux and Windows. Every package can be expanded. A large number of mailboxes and unlimited number of mail aliases, accessible via POP, IMAP and Webmail. All hosting packages include a domain name, mail with this domain name and extensive statistics. Each package includes a certain amount of data traffic. Fair use = per 1 GB size of the site maximum 1 GB of data traffic per month. Patchman is software that is used to check the websites on our hosting platform for malware and software leaks on a daily basis. Security risks in files are signaled and e-mailed to the administrator of the respective hosting package. The mail states what needs to be done. If the administrator does not have the opportunity to solve the problem, Patchman does this automatically. A confirmation by email of the executed patch and / or update will be sent. It is important to check the functionalities of the website (s) after patches and / or updates. If you like working with ASP, ASP.NET, Umbraco or ColdFusion, you choose a Windows hosting package. In the other cases, a Linux hosting package is more suitable. For detailed specifications per package look at Linux hosting or Windows hosting.